Combine potatoes & onions in a sauce pan & cover with water. Bring to a boil. Reduce heat & simmer for 3 minutes. Drain well. 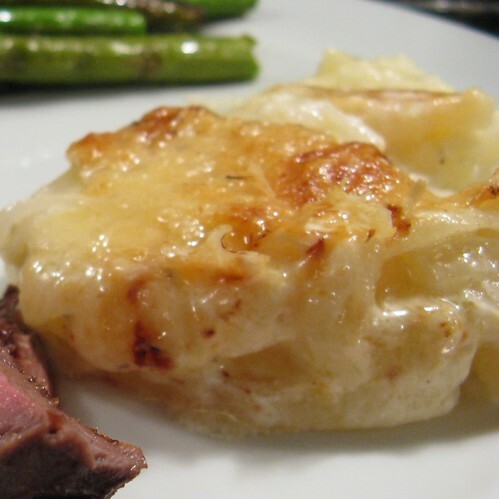 Arrange half the potato and onion mixture on the bottom of a 4 c souffle dish. Sprinkle with 1/3 of each cheese. Season with salt & pepper. Arrange the remaining potatoes & onions on top. Pour the cream over. Season with more salt & pepper. Sprinkle the remaining cheese on top. Now either cover & refrigerate or preheat oven to 400. Bake uncovered for 30 minutes, it should be bubbly & the cream should look a little thicker. Preheat broiler & broil until golden brown, about 2 minutes or use a kitchen torch to brown the top. In my next kitchen, I better have double ovens, because I was really craving something like this last night, but I had a chicken in the oven taking all of the space. I'm saving this recipe! that looks really good. i have the bon appetit that this recipe is in and after seeing it on here, it makes me want to try and make it even more. oooo. i needed a potato recipe for tonight and this will be perfect. Funny that I'm also serving beef and asparagus!! How do you like your Peeps?